Did you know that ICC was the only private sector organization granted accreditation to the Conference on International Organization, a convention resulting in the creation of the Charter? Or that, before being granted Observer Status in 2016, we had held top-level consultative status with the global body since 1946? 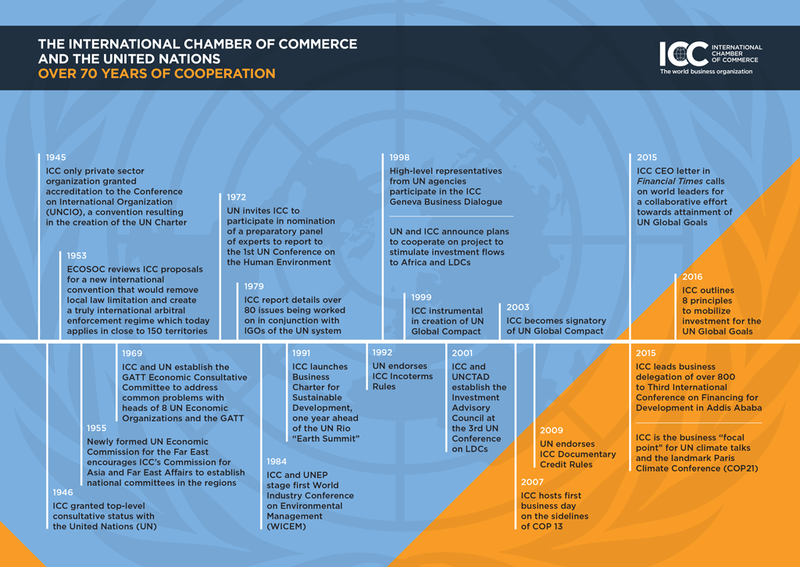 In the 70 years since then, ICC’s relationship with the UN has gone from strength to strength and today we are proud to support UN missions and goals, as the voice of global business in several UN specialized agencies. Here we take a look at just six ways in which the world business organization contributes to the work of the UN. ICC is a prominent champion of the UN’s 2030 Agenda for Sustainable Development. ICC was designated by the UN as the official business representative to the intergovernmental processes that led to its creation-from the Addis International Conference on Financing for Development, the Sendai Framework for Disaster Risk Reduction, the UN Sustainable Development Summit and the Paris Climate Summit (“COP21”). ICC remains the Business and Industry NGO “focal” point for business in the UN Framework Convention on Climate Change (UNFCCC), as well as for the High-level Political Forum (HLPF) on sustainable development, the central body for the follow-up and review of the implementation of sustainable development commitments and the 2030 Agenda for Sustainable Development, including the Sustainable Development Goals (SDGs). ICC actively engages in the work of the UN Commission on International Trade Law (UNCITRAL) whose mandate is to remove legal obstacles for international trade. UNCITRAL’s endorsement of ICC rules governing international commerce and dispute resolution – including our renowned Incoterms© rules – significantly promotes their worldwide acceptance. ICC supports the UN Working Group on Business and Human Rights and continues to be at the forefront in promoting business implementation of the UN Guiding Principles on business and Human Rights, a powerful and critical companion to the Sustainable Development Goals. Upon request by the UN, ICC coordinated business input to the World Summit on the Information Society and today we continue to lead business engagement in follow up activities including the annual UN-linked Internet Governance Forum (IGF). Through its Business Action to Support the Information Society ICC contributes to the United Nations Commission on Science and Technology for Development (CSTD), which was tasked to assist in elements of the summit follow-up. ICC provides global business input into the implementation of the UN Convention against Corruption (UNCAC) and has urged G20 leaders to ratify and implement the convention, encouraging work with non-G20 states toward its universal adoption and implementation. ICC has a close working relationship with the World Intellectual Property Organization (WIPO) – one of the UN’s 17 specialized agencies. ICC provides input into a range of WIPO processes in line with mission to promote efficient intellectual property (IP) systems that support international trade, encourage investment in creation and innovation, and facilitate sustainable economic development.